Dennis Rodman, just back from visiting Kim Jong Un, was escorted out of the Time Hotel in Midtown on Sunday after spending hours at the restaurant bar loudly telling anyone who would listen what a great guy the North Korean dictator is. 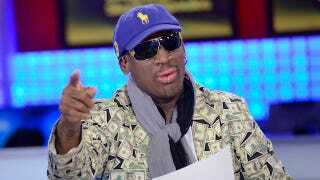 According to the Post's sources, Rodman was also waving around a signed copy of Kim Jong Un's manifesto and telling everyone in the bar that they should read it. What a great guy.